Take elements of Animal Crossing, Rune Factory, Harvest Moon, and everything annoying about In-App Purchases (IAP) and you have a “free” game called Seabeard. 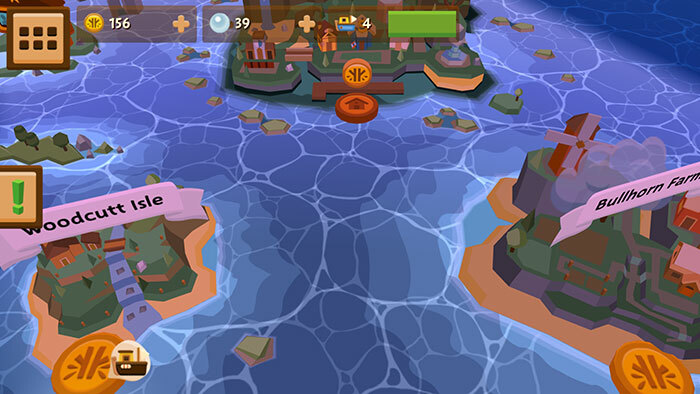 Seabeard is all about restoring your island to its former glory. You do so by clearing out overgrowth, restoring ruins, building new houses, and bringing commerce back to your empty corner of the map. Gameplay is simple: You tap the screen to move and interact. You can decorate buildings, obtain pets, harvest farmable items, explore dungeons, craft recipes, do quests, go fishing, play mini-games, and the typical stuff you’d expect from a game of this type. Watch the video below from the creators of the game for a visual presentation of what you’ll find. 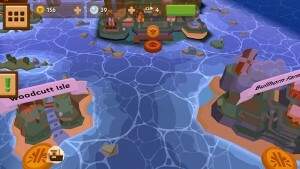 I really enjoy Seabeard’s use of islands. Your have your own island home that you are trying to build up, but you can travel via ship to other islands. Traveling between islands provides an opportunity to play sea-based mini-games where you can earn prizes ranging from gold to rare crafting materials. If you choose not to play a mini-game, you are lifted up by a zeppelin and carried to the next island. One of my favorite features is the ability to set up vendor stalls on your island to sell your goods to the game itself or to other players. I don’t mind the concept of having to put items up for sale and waiting 5 minutes to an hour for them to sell. I also don’t mind having to earn additional slots. I think this system works well for Seabeard, and it’s something I can see working well in other games. Selling your items to other players is also a novel feature for devices like this, and allows people like me to get my friends and family playing so that we can help each other build up faster. Seabeard is one of the best graphical presentations I’ve seen on the iOS. The stylized visuals are captivating, the game runs flawlessly on my iPhone 6 Plus, and I’m once again challenging my previously held belief that phone games have no chance of providing a full-featured gaming experience. Seabeard is capable of providing the exact same experience found in games like Harvest Moon and Animal Crossing. The key word here is capable. 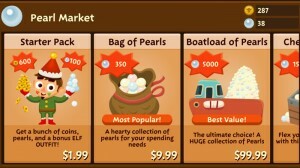 Where Seabeard falls short is in its use of IAPs. The game starts out decently accommodating. Wait 10 minutes here, 5 hours there, spend a few hours earning coins to afford the next building, etc. Then suddenly you hit this wall where it’ll take several hours of doing the same repetitive tasks before earning enough gold to move on. 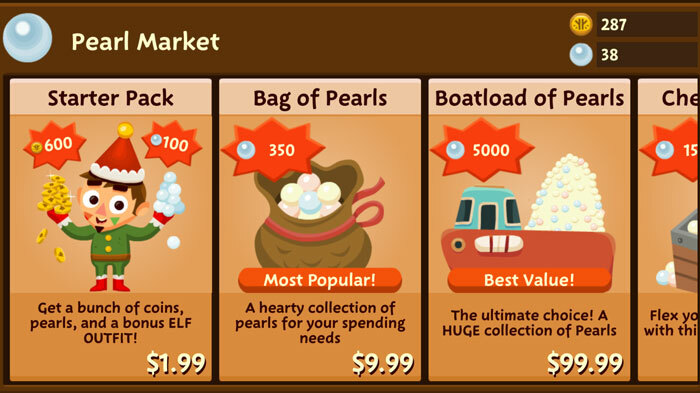 Conveniently you can purchase Pearls or Gold from their cash shop, but the rates are so ludicrous that you’d quickly spend hundreds of dollars before even putting in a decent amount of time into the game. IAPs take what could be one of the best games ever made for phones and warp it into a cash grabbing annoyance. My heart was crushed when this realization came crashing down on me right in the middle of enjoying the game. If Seabeard was available for $20 I would be telling everyone I know to get out there and buy the game. Totally worth that price. But now I’m stuck in this weird position of telling people they may as well avoid playing it because they’ll only be disappointed after about 3-4 hours of play. Despite its enormous and unavoidable flaw, I really do hope people try this out and realize the potential for creating a fully-realized game of this calibre on mobile devices. I like having this type of game with me on my phone — a device I carry with me everywhere — and I like knowing I can pick up and play for 30 seconds or 10 minutes then slide it back into my pocket. It will be interesting to see what game you ultimately end up in. This seems quite a long ways from mmos you talked about when I first started reading but I guess you have a long time Nintendo love and maybe it’s close to that. My tastes changed a lot too over the years, so maybe it’s just that. I imagine it would be hard to write a few stories a week about mmos when the entire genre seems to have gone to hell. While I don’t tend to comment on console or phone app games, I do read them as I am always interested in being kept updated on the state of the gaming industry in general. Thanks for the stream of interesting information over the years! You know us. Just posting about whatever we’re playing from iphone apps to MMOs to board games. Right now it’s all about finding a way to not go insane while waiting for EQ Next/Camelot Unchained and planning a wedding. Kidding aside, that’s one of my main downer with mobile games. There are way too many games in which spending money is not optional and you actually need to spend way too much money on a constant basis just to keep you running. These games created a bad reputation for the genre and I’m now afraid of even shelling a couple of dollars for a paid game. Where’s my guarantee that my 5$ now won’t be 50$ next week and 100$ the following because you also have a money grabbing cash shop in top of the initial cost ? I just got married myself and I’m exhausted, To expand on that, I should say that we got married on the 20th December, then we went on a whirlwind tour, seeing family and friends for Christmas, then we went on a short break…a “minimoon” as my Wife called it. Finally finishing with a drive across the country to my mates wedding on the 3rd Jan, where I had best man duties. Looking forward to more articles in 2015, regardless of subject matter. On the subject of this one; I echo the comment of Maljjin above, with regards to the things that disappoint me with mobile games that rely on IAP that have been implemented poorly and priced outrageously.